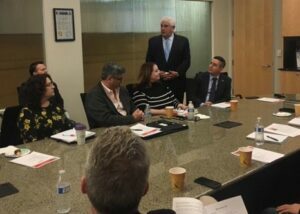 Last Friday, City/County Legislative Committee hosted its first meeting of the year with guest speakers: Hasan Ikhrata (Executive Director, SANDAG), Mike Hansen (Director – Planning Department, City of San Diego) and Tom Tomlinson (Assistant Director – Planning Department, City of San Diego). After a nationwide search SANDAG appointed Hasan Ikhrata, former Executive Director of the Southern California Association of Governments (SCAG), as the Executive Director overseeing the San Diego region’s 18 cities, the County of San Diego and a $1.3 billion annual budget. 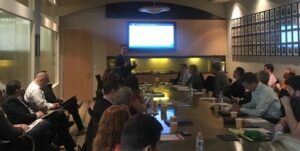 Ikhrata discussed his vision and priorities for San Diego which includes adopting a new regional transportation plan and their proposal with Mayor Faulconer to redevelop the SPAWAR property into a transit hub which could include housing, offices and retail space. Mike Hansen and Tom Tomlinson discussed the City’s proposal to increase the General Plan Maintenance Fee from $275 to $450. Planning staff also discussed their priorities which includes bringing their revised TPA Parking Standards to City Council this year, Community Planning Group restructuring, and updating the College Area and Uptown Community Plan Updates. The BIA’s City/County Legislative Committee addresses issues that pertain to all aspects of the building industry for the City of San Diego and the unincorporated areas of the County of San Diego. This is an open committee which meets the 3rd Fridays of the month from 7:30am-9:30am at the BIA Office. February’s meeting guests include the San Diego County Water Authority. If you have any questions about this Committee or would like to be included in the distribution list, please contact Angeli Calinog.